The Small Cube Limestone Fireplace is perfect for any homeowner or renter looking for a way to add a bit of cosiness to the home. The Small Cube Fireplace is a modest and modern looking fireplace built for the smaller areas in a home. With straightforward, symmetrical lines and a simple design, the fireplace is designed to be able to blend into almost any room. Constructed out of beautiful limestone, the fireplace is less than 48". This makes it perfect for adding warmth and style to a small space. Each fireplace comes with a minimum 1 year warranty. This knowledge will allow you to rest easy knowing your fireplace is built to last you for the long haul. Additionally, the fireplace comes with a generous mantle. The mantle adds subtle elegance, and it provides an area for the owner to display small items to provide additional decoration for the room. 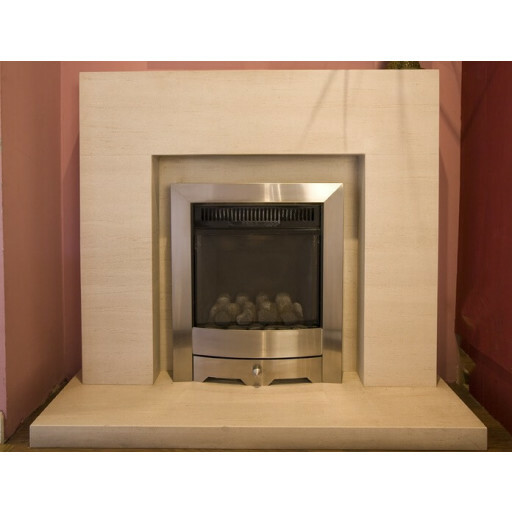 The Small Cube Limestone Fireplace is suitable for both gas and electrical fires. It is unable to burn wood. You will be able to enjoy the modern style of the fireplace and the generous warmth provided by the unit for many years to come. We could only have a small fireplace and we saw this at Bolton store looked nice in the store but it was even nicer when we had it fitted. What a neat little modern fireplace. I needed something small but all the modern ones seemed huge till I spotted this beauty. It looks great in my small flat.